Since the early 1990s, Sony has pursued environmental initiatives in accordance with its environmental principles and targets. 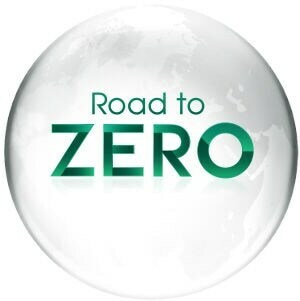 In April 2010, Sony announced the "Road to Zero," a new global environmental plan. This plan consists of the Sony Group Environmental Vision and several sets of mid-term environmental targets, which form key milestones on the road to achieving the Vision. As stated in the Sony Group Environmental Vision, Sony strives to realize a sustainable society by achieving a zero environmental footprint throughout the life cycle of its products and business activities. It is this long-term goal that prompted Sony to name its new global environmental plan "Road to Zero." Under this plan, Sony aims to bring its environmental footprint to zero by 2050 and works to achieve incremental mid-term environmental targets toward this end. Sony is working toward its goal of having a "zero environmental footprint" by 2050, setting mid-term (5-year) environmental targets progressively backcasted from 2050, and adjusting fiscal year targets based on current achievement levels. This approach will enable Sony to work steadily toward achieving the zero environmental footprint goal, while making ongoing adjustments based on current progress. In 2011, Sony established the Green Management 2015 environmental mid-term targets (fiscal 2011–2015), which was its first step on the road to a zero environmental footprint, achieving almost all of its targets by 2015. Currently, Sony is implementing initiatives to achieve the goals it has set under the Green Management 2020 environmental mid-term targets (fiscal 2016–2020). 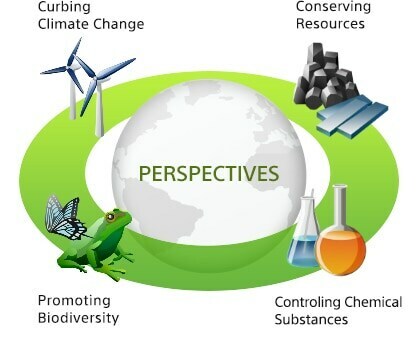 Sony's environmental mid-term targets define concrete targets at each stage of the product life cycle, from the four priority perspectives of climate change, resources, chemical substances, and biodiversity. Sony is working with multiple environmental NGOs and experts to gain feedback on Sony's initiatives under each priority perspective. Sony carries out initiatives under the following policies, which it has outlined for four environmental perspectives of climate change, resources, chemical substances, and biodiversity, in order to achieve its environmental mid-term targets. Sony strives to achieve zero emissions of greenhouse gases from its business activities and throughout the life cycle of its products and services. Sony sites make it their highest priority to reduce energy consumption and greenhouse gas emissions, use energy more efficiently, and switch to energy sources that generate less greenhouse gas emissions, while also promoting renewable energy use. Sony also develops and supplies energy efficient, environmentally conscious products and services, and works with manufacturing subcontractors and suppliers of components and raw materials in an effort to reduce greenhouse gas emissions both directly and indirectly. Sony seeks to minimize the consumption of resources and maximize resource recycling in order to use resources effectively in its business activities and throughout the life cycle of its products and services, while striving to achieve zero consumption of new materials made from "key resources. *1" Sony minimizes resource consumption by reducing the weight of products and utilizing resources more efficiently in its internal operations. Sony is also working to extend the life of products through quality and durability enhancements, to indirectly reduce resource consumption. In terms of waste, Sony recycles waste generated from internal operations, with the goal of eliminating landfilled waste. Additionally, Sony designs products to facilitate recycling and implements ongoing programs to collect and recycle end-of-life products according to the needs of local communities, while also promoting advanced recycling with recycling companies. *1At Sony, "key resources" are designated by taking the following factors into account: resource depletion, resource availability, environment impact of resource extraction, and loss of biodiversity and community impacts from resource extraction. Although water circulates around the earth continuously through the water cycle, the amount of water available for use by the planet's inhabitants is limited. With population growth and other issues putting further pressure on water supplies, the importance of conserving this resource will increase in the years ahead. Taking into account the locations of its sites, as well as regional differences, Sony will continue taking steps to minimize its withdrawal of water and to ensure the water it returns to water sources is of a quality that does not negatively impact the environment. Recognizing that paper resources are limited, under the Sony Group Paper / Printed Material Purchasing Policy, Sony constantly works to reduce paper consumption while prioritizing the procurement of environmentally preferable paper, such as paper made from resources sourced from certified forests and recycled paper. Sony endeavors to minimize the risk that chemical substances it uses might cause serious harm to human health and the environment. Chemical substances used in Sony products are suitably managed based on available data including national regulations, toxicity, environmental impacts, applications, and content level in components and products. Sony adopts a precautionary approach and takes steps to identify and strive to eliminate substances considered to be high-risk, even in cases where scientific evidence is insufficient, thereby reducing potential impact on the environment. Sony manages the type and application of chemical substances used at business sites, and for high-risk substances sets criteria for managing each substance to either prohibit their use or reduce emissions or amounts transferred. Sony also prohibits the use of certain substances in manufacturing processes in the supply chain which are restricted under international frameworks because of environmental impacts throughout the life cycle. Recognizing the importance of natural capital and the ecosystem services it supplies, Sony endeavors to conserve natural capital and biodiversity, both in its business activities and through community initiatives. Sony has identified the following basic principles*2 to guide its initiatives. Sony recognizes the importance of biodiversity issues. Sony recognizes that biodiversity is an important issue in its business activities, endeavors to reduce the impact of its business activities on biodiversity (both directly and indirectly in the supply chain),*3 and engages in community initiatives that help to conserve natural capital and biodiversity. Sony helps achieve the Aichi Biodiversity Targets by engaging in initiatives to conserve natural capital and biodiversity throughout the life cycle. Sony cooperates with stakeholders where needed in pursuing the above principles. Sony actively discloses information about these initiatives and endeavors to raise awareness about biodiversity. *2For Sony's stance on the consumption of paper resources as it relates to biodiversity, please refer to "Policy on Paper Resources." *3This includes reducing the environmental impact of Sony's business activities, such as reducing greenhouse gases, conserving resources, and comprehensively managing chemical substances, while also reducing the impact on biodiversity as a result of achieving these environmental targets. As a company that strives to help build a sustainable society, Sony believes that addressing environmental issues is crucial to achieving this goal. Sony also recognizes the importance of such efforts from the perspective of business continuity. The failure to take appropriate steps to respond to such issues involves various underlying risks that could negatively impact Sony's operations. These include risks involving new or amended laws or regulations that could elicit higher carbon taxes, broaden the geographic applicability of emissions trading schemes, or impose tougher energy-saving standards on products. Another example is physical risks, such as the risk of rising sea levels and abnormal weather patterns caused by climate change. There is also the market change brought about by evolving consumer perceptions. Sony realizes that flawed responses to such risks and changes could have major social and financial ramifications. Accordingly, Sony works constantly to assess underlying risks, as well as to ensure it is prepared to respond effectively to those risks that it judges likely to have an impact on its operations. Sony has, for example, established and continues to maintain a system for quickly collecting information on laws and regulations in force in countries around the world and to ensure that its business activities and products comply. Addressing environmental issues opens up business opportunities for Sony. For example, the adoption of the Paris Agreement*1 at the 2015 United Nations Climate Change Conference (Conference of the Parties 21: COP 21) held in December 2015 has increased social awareness of climate change issues, which will raise consumer demand for energy-efficient products. Sony has been improving energy efficiency across a broad range of products, which will further cement the advantage of Sony products amid growing social awareness. In the image sensor category of its devices business, Sony possesses technologies that deliver both high performance and low power consumption. Sony sees significant growth potential for its image sensors. One growing application is for on-board cameras for automobiles. Sony will continue to enhance its products and secure differentiation in the image sensor market, on the strength of its proprietary elemental technologies in areas like power consumption management, signal processing, and recognition algorithms. *1The Paris Agreement was adopted at COP 21 to provide an international framework for addressing climate change in 2020 and beyond.